We installed two hives of honeybees today at La Casa. 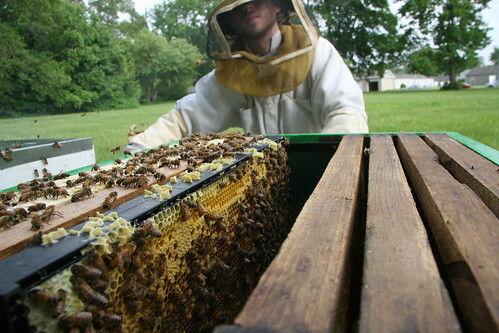 Fellow co-oper, Robby from across town will be using our yard (and pollen) to raise honeybees. Robby got his hive boxes from his grandfather who was a beekeeper. 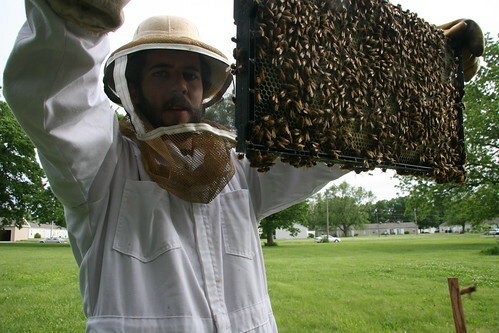 Robby’s been taking classes from the Central Illinois Beekeeper’s Association: CEIBA. Last night we picked up the bees from a queen breeder near Danville. They were sealed in boxes for transport in the van. 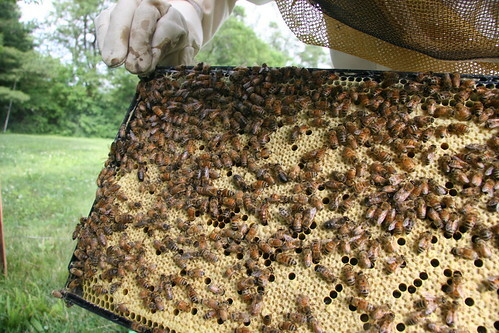 About 10,000 bees came with each queen. Five frames from a two healthy colonies, along with a two queens were put into boxes. Today we tranported the frames into the hives. Robby moved the first colony, and I moved the second. We had to wear full bee suits otherwise the bees would have stung us many times. It was quite a rush carrying the frames full of bees and being careful not to disturb them too much. We took a bunch of photos, and I’m just going to go ahead and post most of them. Robby tried to calm the bees down with sugar water. There were hundreds flying around us as we were working. 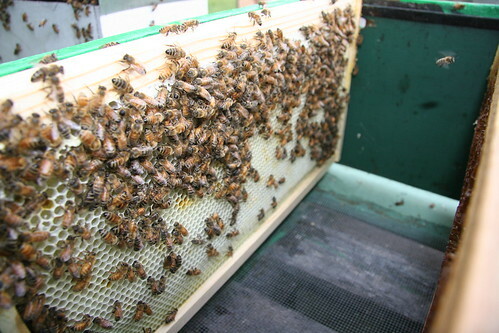 This is what frames look like installed in the hive. There are ten frames in each section of the hive. We mixed the five frames full of honey and brood (developing bees) in with 5 clean frames. Most of the frames are installed. Just a few more to squeeze in. You can see the queen crawling around in this photo. There’s a little green dot on her back. Try this hi-res version if you want to see her up close. She has a longer body and smaller wings. I suited up and moved the second set of frames while Robby took photos. This time we tried the smoker instead of sugar water. The smoke calms them down and confuses their communication. Robby snapped this nice photo. Calming them with more smoke. Only two frames left to move. The other queen. Look for the green dot. Hi-res. All put back together. Bees installed. The next move is to put more boxes with clean frames on top. The hives are designed to be modular, building up from the bottom box. Two big boxes at the base are where the queen builds up her colony. Then at some point smaller boxes are placed on top with a screen that lets only the workers past. 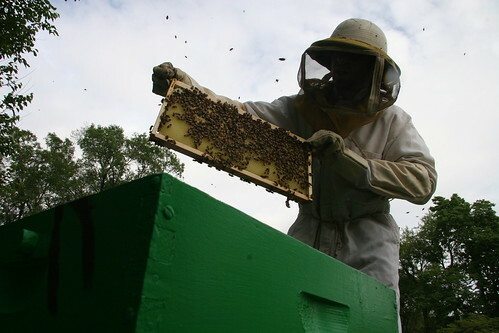 Since only the worker can access the top boxes, no eggs are laid and they become full of honey. Since we’re starting this hive pretty late in the season, we might not get much honey this year. 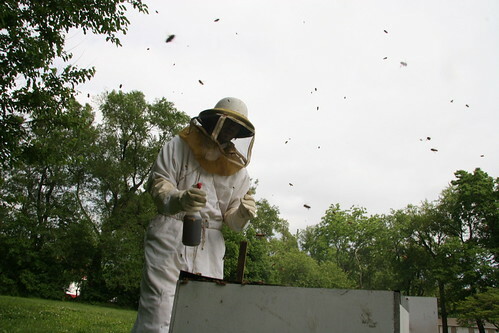 But its still a worthwhile project and if the hives survive the winter, we’ll have plenty of honey next year. Thanks for putting this up on the blog JP! I am really excited to share this experience with readers and am open to questions. All in all I find it unbelievable that the bees are finally at La Casa. 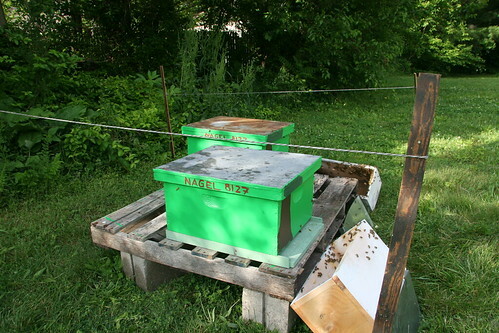 The process of finding and preparing the hives and then installing the bees was incredibly smooth and easy. It just seemed that everyone- from La Casa folks to the Illinois Dept. of Agriculture were excited and supportive of my idea. It just took a few months of talking, planning, and working. It’s amazing to now watch them fly in and out of the hive, gathering pollen and nectar from flowers all over Urbana. I would to share some things I learned from the experience. When I took off the lid of the nuc and thought about trying to transfer the frames, there were a lot of bees flying and buzzing around my head. Despite spraying them with sugar water the buzzing seemed to intensify. So at that point I think it was a good idea to walk away from the hives and get the smoker going. 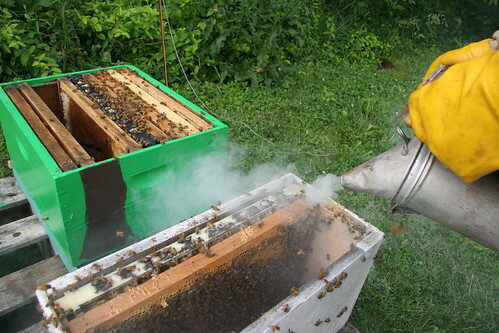 I think the smoke worked better to calm the bees down and get them ready to be moved by sending them into the frames. I felt most comfortable with the smoker. I also think it was super helpful to have someone else there. I’m just a beginner and watching JP work with the bees gave me some means of comparison. I think JP applied the smoke a bit smoother while I kinda just shot it out at them. 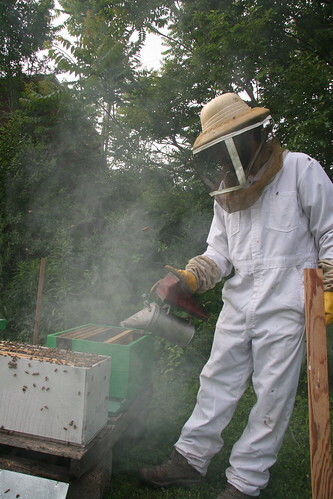 Smooth smoke is probably cooler so it is less likely to burn the wings of the bees. They’re fragile! Taking pictures was also a great idea. 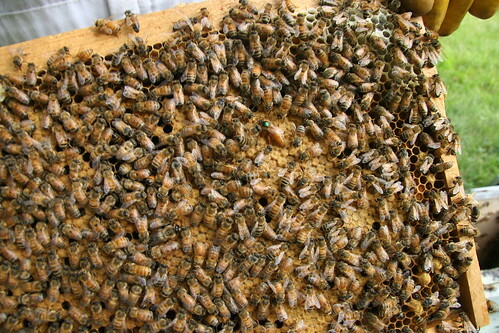 Looking at the pictures, you can see that the queen’s laying pattern is pretty good. I did not think to pause and look at this while I was transfering the frames, so being able to look at it later is very helpful. The bees are of the Carniola breed of European honey bees. They originated in Slovenia and parts of Austria. I chose these bees because of their gentleness and their ability to forage and survive at colder temperatures. I have read online in numerous places that they may have an increased tendency to swarm, so I think we have to watch this next spring. Italians would have been a good choice as well, because they are gentle and strong producers. I hope one day (perhaps next year) to work with an Italian colony. These two are a good start!